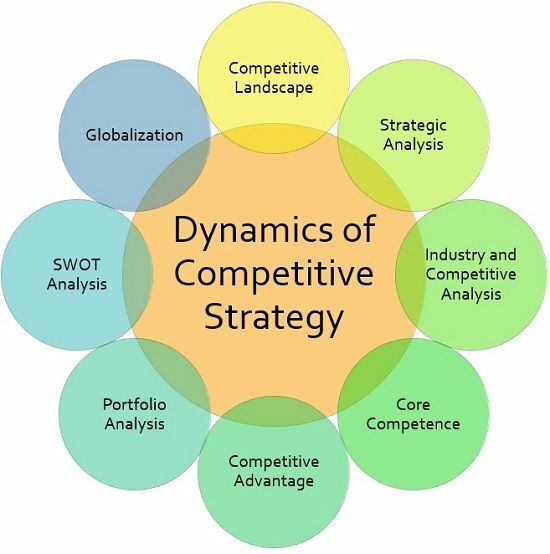 Definition: Competitive Strategy can be defined as the firm’s long term action plan that formulated by considering several external factors, that helps the company to achieve competitive advantage, increase the share in the market and overpower rivals. Competitive advantage is the result of the firm’s excellence in performing activities. The firm’s external environment, has the potential to influence the company’s internal environment, especially the economic and technical elements. The company should have an idea of its market position, in relation to its competitors, which assists the company in competing in the market. Competitive Landscape: It tends to identify and understand the competition deeply while cognizing the vision, mission, objectives, strengths, weakness, opportunities and threats of the enterprise. While analysing the competition, the firm also keeps an eye on the competitor’s overall position in the market, to choose the right strategy for the enterprise. Strategic Analysis: It implies the detailed examination of various components of the firm’s business environment. It is important for strategy formulation, strategy implementation and strategic decision making. Industry and Competitive Analysis: The analysis in which a number of methods are used to have a clear view of the basic industry practices, the intensity of competition, strategies of competitors and their share in the market, change drivers, profit prospects and so forth, is called as Industry and Competitive Analysis. It assists the company in strategically observing the condition of the industry. Core Competence: Core competencies of the company are those capabilities which help the company in defeating its competitors by gaining a competitive advantage. It is a blend of company’s technical and managerial know-how, skills, knowledge, experience, strategy, resources, manpower, etc. Competitive Advantage: Competitive Advantage assist the firm in defeating its rival organization, through its core competencies which include a combination of distinguishing characteristics of the firm and the product offered by it, which is considered as outstanding, that has the edge over its competitors.Simply put, competitive advantage is when the profitability of an organization is comparatively higher than the average profitability of the other companies operating in the same industry. Portfolio Analysis: It is a management tool which helps the company to analyze its product lines and business units, from which good returns are expected. In other words, it identifies and evaluates those products and strategic business units which help the company to survive and grow in the market. SWOT Analysis: SWOT Analysis is the analysis of the firm’s strengths, weakness, opportunities and threats, to generate strategic alternatives. It aims at facilitating the management in developing a business model, which accurately aligns the firm’s resources and capabilities, according to the business environment. Globalization: In basic terms, globalization refers to the process through which a business or any other organization creates its presence across the world and begins its operations on an international scale. A competitive strategy is used to attract customers, gain an edge over its competitors, increase market share and strengthen its position, and expand the business to a larger scale.